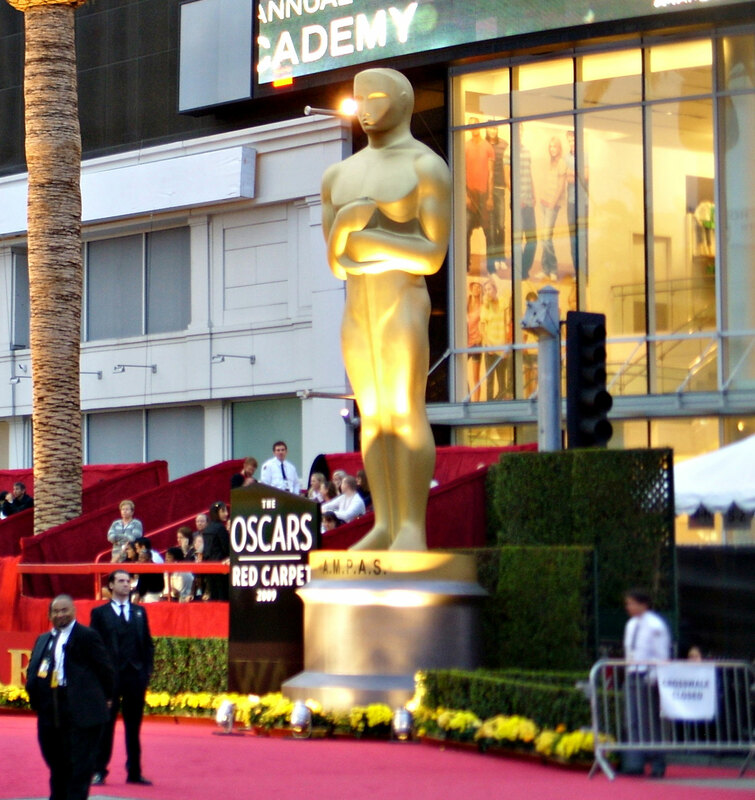 Jesse L. asks: Why are the Oscars called the Oscars? No one is 100% sure, though the popular theory is that the nickname for the “The Academy Award of Merit”, as it is actually named, was coined by Academy Award librarian and future Director of the Academy of Motion Picture Arts and Sciences, Margaret Herrick. Supposedly she bestowed the nickname on the statuette in 1931 when she took the job as the Academy’s first librarian. Upon first seeing the statuette, she remarked that it looked like her Uncle Oscar (wheat and fruit farmer, Oscar Pierce, who was actually her cousin. She later stated the similarity was from the fact that he was a “Texas farmer of dignity, austerity, and commanding authority.”) According to Emanuel Levy, author of All about Oscar: The History and Politics of the Academy Awards, columnist Sidney Skolsky was there when she said this and would later write that “Employees have affectionately dubbed their famous statuette ‘Oscar'”. While the first documented instance of “Oscar” as the nickname for the statuette was by Skolsky (in a 1934 New York Daily News article), the problem with this version of things is that there doesn’t seem to be any evidence that Skolsky actually said or wrote the above quote. Herrick herself never produced any evidence whatsoever to back her later claims that she coined the nickname, even after Skolsky offered to buy her Rudolf Valentino’s Falcon Lair estate or alternatively seal all her envelopes for a year if she could produce any evidence that she had coined this moniker before March 16, 1934, when Skolsky first used it. Despite the fact that the two were on friendly terms (even with this little disagreement), she never produced any such evidence to back her claim. Much has happened since I covered my first Academy Awards, on March 15, 1934… (Note: he’s got his date off by one day here, it actually occurred on March 16th) It was my first Academy Awards night when I gave the gold statuette a name. I wasn’t trying to make it legitimate. The snobbery of that particular Academy Award annoyed me. I wanted to make the gold statuette human. I had witnessed the proper table bit for the first time. I returned to my table to eat the chicken, now cold. I listened to the long speeches by the Academy president and leaders of the industry. I listened to the acceptance speeches I had heard at the prop banquet table, now spoken with false surprise. There I was with my notes, a typewriter, blank paper, and that Chandler feeling. I’m not a good speller, and I didn’t have my dictionary with me. When it came to write gold statuette, I had to get up and ask the Western Union manager how to spell statuette. His spelling of the word lasted for a page. After I had filed the page and couldn’t refer to it for the spelling of statuette, I had to walk over and ask the manager again. The word “statuette” really threw me. Freud would explain that I resented the word and didn’t want to know how to spell it. You know how people can rub you the wrong way. The word was a crowd of people. I’d show them, acting so high and mighty about their prize. I’d give it a name. A name that would erase their phony dignity. I needed the magic name fast. But fast! I remembered the vaudeville shows I’d seen. The comedians having fun with the orchestra leader in the pit would say, “Will you have a cigar, Oscar?” The orchestra leader reached for it; the comedians backed away, making a comical remark. The audience laughed at Oscar. I started hitting the keys…. During the next year of columns, whenever referring to the Academy Award, I used the word “Oscar.” In a few years, Oscar was the accepted name. It proved to be the magic name. For almost a year bright little Sidney Skolsky has been a columnist without a column. A onetime Earl Carroll press-agent and Broadway gossip, Skolsky went to Hollywood for the New York Daily News in 1934, quit three years later when he was ordered back to New York. He worked for a while for King Features Syndicate, but he and Louella Parsons disagreed on whether Garbo would marry Stokowski (Skolsky was right) and that got him in bad with Hearst. Since the fall of 1938 “the little black mouse” has been a familiar sight in Hollywood studios and night clubs, but nobody has given him a contract. Along with Margaret Herrick’s claim, Bette Davis also later said that she coined the nickname after Harmon Oscar Nelson, her first husband. However, what is not often noted when you read that “origin” story is that she later retracted her claim when she realized she had her dates wrong and that Skolsky had published several articles referring to the statuette as “Oscar” before she first started calling it that. Despite Skolsky being the only one with actual evidence to back his claim of coining the nickname for the Academy Award, his assertion is still slightly in doubt. Many claim that during Walt Disney’s Academy Award acceptance speech for Three Little Pigs in 1934 (the same year that Skolsky first covered the Awards), Disney referred to the statuette as “the Oscar”, which was supposedly an already well established nickname for it within the industry. However, other than the fact that numerous seemingly reputable sources say this was the case, nobody seems to have bothered to cite where they got this potential fact and all efforts by me of finding a transcript or even a first hand account of that speech to verify the claim have been fruitless. It has also been claimed by the “Walt Disney” origin story crowd that the term Oscar was commonly used as a mocking nickname for the Academy Award (as Skolsky claims he used it as). In this version of things, though, Walt Disney was supposedly the first in the industry to publicly use it in a positive light when he gave that acceptance speech. Perhaps Margaret Herrick really did for some odd reason think the statuette resembled her uncle. Or maybe Skolsky really did come up with the moniker (whether he did or not, he certainly helped popularize it and is the only claimant to have documented evidence to back his assertion). Or perhaps it was named such for some completely off the wall reason like that the word “Oscar” comes from the Old English “Osgar” meaning “god’s spear” (“gar” meaning “spear” and “os” meaning “god”). In the end, nobody really knows why the Academy Award statuette is called an “Oscar” and, as generally happens with the absence of a definitive origin, some cutesy anecdote ends up being the popularly touted story, such as in this case with the Margaret Herrick “Uncle” story. In case you’re curious, the idea for the design of the Academy Award statuette was thought up by MGM director Cedric Gibbons. His idea was to have a knight gripping a sword while standing on a film reel (nothing pretentious there) ;-). Sculptor George Stanly was then hired to create the actual statuette based on this design idea. The first Academy Award’s ceremony was held on May 16, 1929 in the Blossom Room of the Roosevelt Hotel in Hollywood. The nickname “Oscar” wasn’t officially adopted for the statuette by the Academy until 1939. Incidentally, the Academy states that the five spokes on the film reel the knight is standing on signify the original five branches of the Academy: writers, directors, actors, producers, and technicians. Why are the Emmy Awards Called That? Why is the Oscar Statue Called Oscar? In an acrimonious split with a business partner, he said, “I even named the restaurant!” Which he hadn’t, I had. When I pointed that out, he said, “prove it.” How does one prove such a thing? I believe Herrick, though she may not have meant to name it.